Stay with style & enjoy a very welcoming atmosphere. 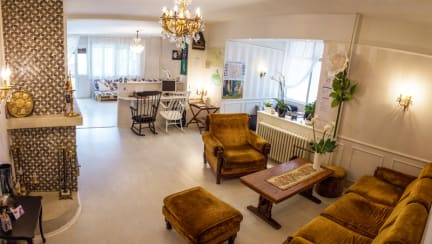 Created with love, the very stylish Lounge Hostel is the perfect place to have a great time, offering fellow travelers a unique experience in an eye-catching interior with very welcoming atmosphere. Enjoy your time in Skopje in a historical building, located in one of the oldest and most beautiful neighborhoods in the heart of the city, Debar Maalo. Literally 10 steps away from our hostel, you can enter the greenery of the City Park. Your morning run or your peaceful and relaxing walk in the park are just few steps away, and a 10 min. walk will take you to the City Square, to the Museums Quarter and the mesmerizing Old Bazaar. For the ones that prefer healthy raw food, the Green Market, Vegetarian restaurant, the Traditional restaurant street as well as the Bohemian street are in a 5 min walking radius from the hostel. Numerous cafes, restaurants and a pizzeria are also within two-minute walking distance. During the night you can enjoy a drink in the City Park and party till the morning in the numerous open air night clubs. For the cycling lovers, two very well equipped bike stores are located just across the street. The hostels double lounge area is huge, spacious, stylish, equipped with comfy couches for you to chill. For the cold nights, you can warm yourself around the fireplace. If tired you can just lay back, refreshing yourself with some local juices from the mini bar. Free Wi-Fi internet connection is provided everywhere through the hostel area, from the double lounge areas to the rooms. For the romanticist, you can write your letters the old school way on the typewriter. Free organic tea and coffee are available all day long. From kettle, electric juicer, toaster, to every little important appliance, our kitchen is fully equipped for you to prepare a delicious meal. You can keep your own food in the fridge with your name tag on it. The kitchen with its spacious dining place is at your service 24/7. Also, you can use the organic herb that grow in our mini garden. Clean and fresh linen & towels are provided for you no extra charges. Cleanliness and neatness are very important. The hostel has two fully equipped common bathrooms (including bidet), soap, hairdryer and hot water 24 hours a day. As for security, the hostel door is controlled 24 hours a day, with surveillance camera. For your luggage, huge secure in room lockers are provided, all included. Want to explore more after check out? Feel free to leave your backpacks, bags and all other stuff for couple of hours free of charge. We will help you organize the day so you can have an unforgettable exploration time in the rapidly-transforming Balkan metropolis, Skopje. Equiped kitchen, very basic breakfast.